LAUSANNE, Switzerland, May 31, 2017 — The World Baseball Softball Confederation today unveiled the official game schedule for the WBSC U-18 Baseball World Cup® 2017, which will be staged from 1-10 September in Thunder Bay, Canada. Baseball’s 28th U-18 world championship will be contested over 50 games and three stages: Opening Round (Group Stage), Super Round and World Championship Medal Round. A record nine Top 10 countries have qualified into the 12-nation, premier youth baseball global tournament, which will feature the best 16- to 18-year-old baseball players and future stars/first-round draft picks from around the world. Game 1: World No. 1 Japan, Asia’s U-18 champions, and Americas powerhouse Mexico will collide to officially open the tournament. Japan has captured the silver medal in the last two U-18 Baseball World Cups (2015 and 2013). Game 2: European U-18 runners-up Italy will take on Central America’s Nicaragua. Game 3: In a rematch of the U-18 Baseball World Cup 2015 bronze medal game, Oceania U-18 champions Australia and world No. 3 Korea will open together. Game 4: Three-time defending U-18 world champions United States will open against European U-18 champions Netherlands. Game 5: World No. 10 Canada and Asia U-18 runners-up/world No. 4 Chinese Taipei will meet on Day 1. In their last meeting at the U-18 Baseball World Cup 2015, Canada defeated Chinese Taipei, 6-2. Game 6: International baseball powerhouse Cuba will open against Africa’s top-ranked baseball nation, South Africa. The Cuban U-18 National Baseball Team has won the junior world title a leading 11 times. 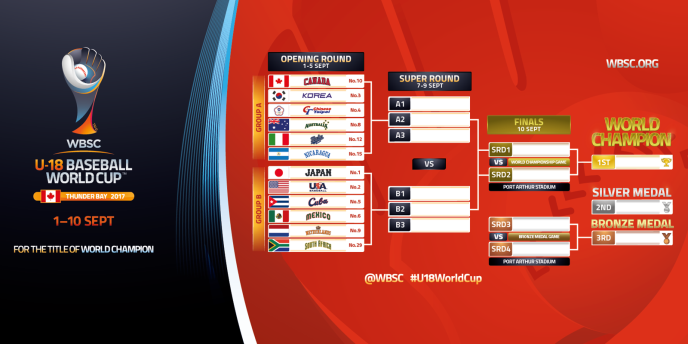 Day 2 will feature the much-anticipated re-match of the last two U-18 Baseball World Cup Finals, Japan versus the United States — the U.S. won the world championship contests both times by one run (2-1 in 2015 and 3-2 in 2013). Following the 30-game Opening Round, the top three finishers from Group A will battle the top three finishers from Group B in a three-day Super Round. A Consolation Round will be staged for 7th to 12th Place. The two nations with the best records following the Super Round will play For the Title of World Champion on Sunday, 10 September, at 17:00. The 3rd/4th Place Bronze Medal Match will be staged at 12:00. At the last U-18 Baseball World Cup, the finale attracted over 15,000 fans to historic Koshien Stadium in Osaka and its prime-time broadcast was the day’s most watched TV programme in host nation Japan, while online viewers from 93 countries and territories followed via live-stream. Broadcast schedule/live-streaming details will be announced in an upcoming news release. Tickets for the XXVIII WBSC U-18 Baseball World Cup can be purchased at www.thunderbay2017.com.